We will be looking at the data logging instruction in the BRX Series PLC and how to retrieve and view this information. Let’s get started. The BRX Series PLC provides two different ways to store logged data. You can use the system RAM or the micro SD card. A removable memory card (Micro SD) can be purchased and inserted into the CPU unit of the BRX Series PLC. This card can be up to 32GB and formatted to FAT32 before it can be used. All current speeds for memory are supported by the BRX PLC. Insert microSD card with notched side down. Gently press into microSD receptacle until click is heard and felt. To remove the card, press in microSD card until click and release. The card will move out. Gently pull microSD card from slot. Note: The microSD card will become mounted when the PLC (MPU) multi processor unit recognizes and renders it accessible for use. The BRX Series PLC has several different instructions for the File System. This will allow you open, close, read, write and perform file system commands. There is even an instruction to create a PLC image file for backups of the system. 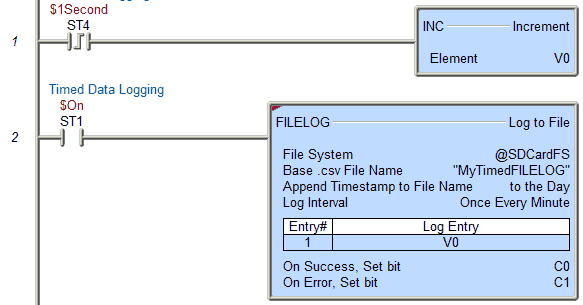 We will be focusing on the FILELOG – Log to file instruction. 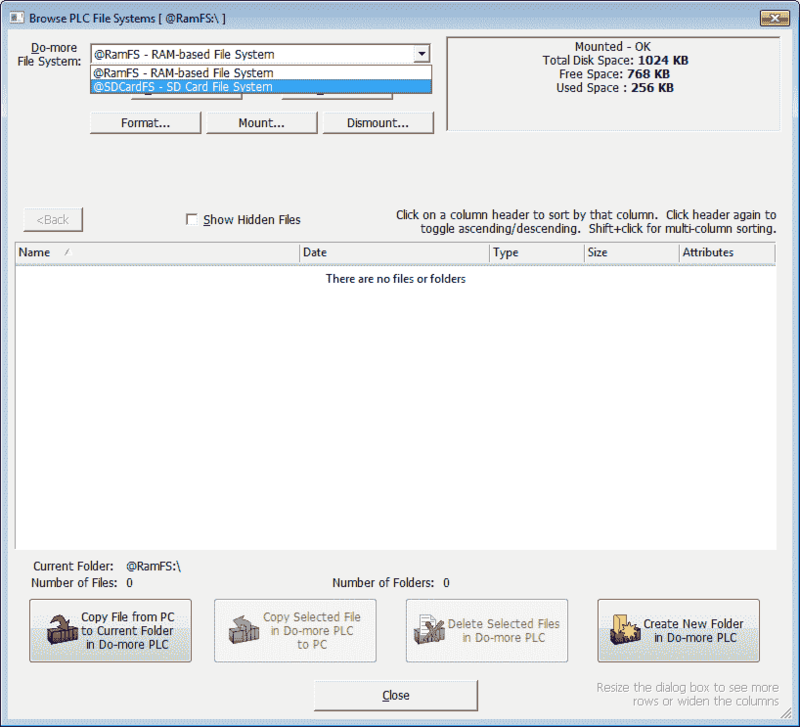 File System – @RamFS – on board 1 MB file system in all Do-more CPUs. @SDCardFS – Removable media installed in the micro-SD card slot on the BRX only. 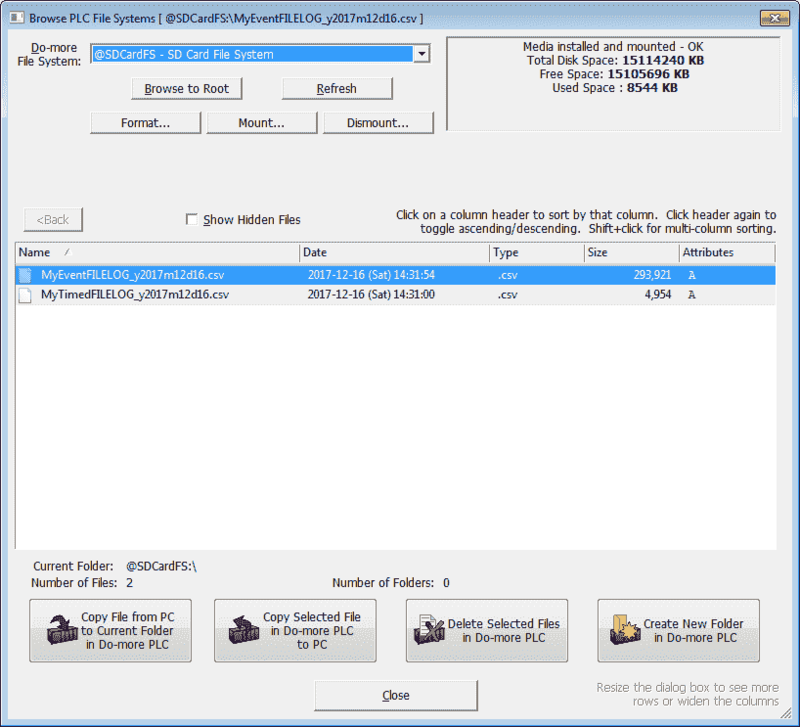 Base .CSV File Name – This is the name of the file that will be stored. Append Timestamp to File Name – This is a selection that will help ensure that all of the file names used will be unique. New information will not get over written. 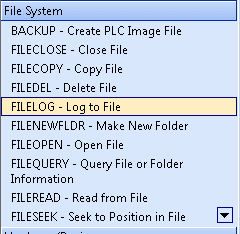 Generate File Name – This option will place the name of the file in a character string within the memory of the PLC. List of Element to Log – This is where we specify the information that will be logged each time the instruction executes. The list can be 50 entries maximum. You can specify an element or range of elements. 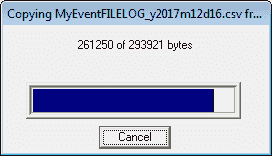 The maximum size for the log entry is 1024 bytes. Note: A time stamp is already included in each entry. On Error bit – This bit will turn on when the instruction execution is unsuccessful. Let’s look at an example of a timed FILELOG instruction. In our example we will be writing to the microSD card. 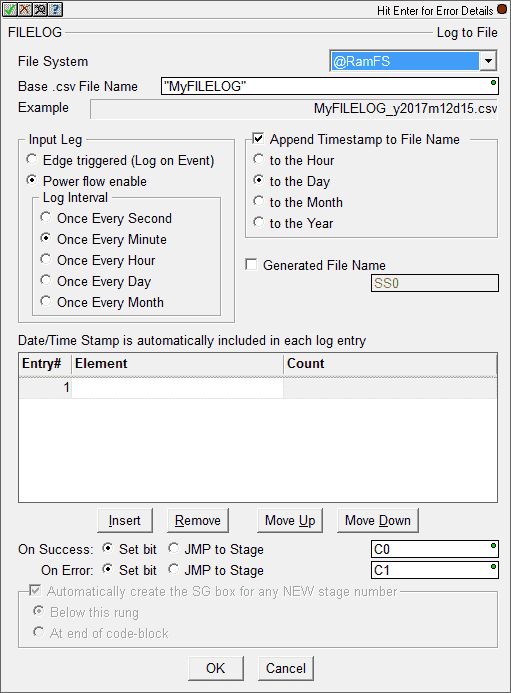 (@SDCardFS) The name of the csv file will be “MyTimedFILELOG” with the date added. We will set this to log once every minute. Our logged information will come from V0. We will be logging just the one register. C0 and C1 will be set upon success and error of the instruction execution. Here is the ladder logic. You will notice that V0 will increment every time the $1 second system pulse bit turns on. The File Log instruction will be always on using the system bit. Since we set the logging every minute we should see in our log file the value in V0 60 seconds apart. Here is an example of an event FILELOG instruction. In our example we will be writing to the microSD card. 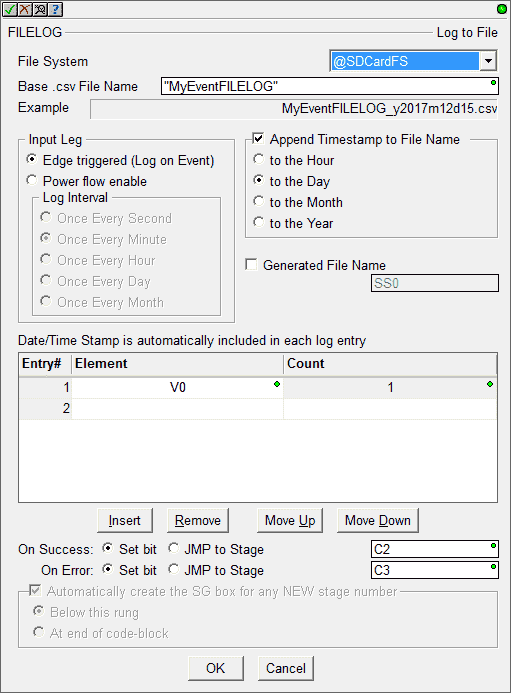 (@SDCardFS) The name of the csv file will be “MyEventFILELOG” with the date added. This is logged every time the instruction is executed. Our logged information will come from V0. We will be logging just the one register. C2 and C3 will be set upon success and error of the instruction execution. We are executing this LOGFILE instruction by the system 1 second clock bit pulse. This means that we should see the value in our logged information be incremented by one every entry. 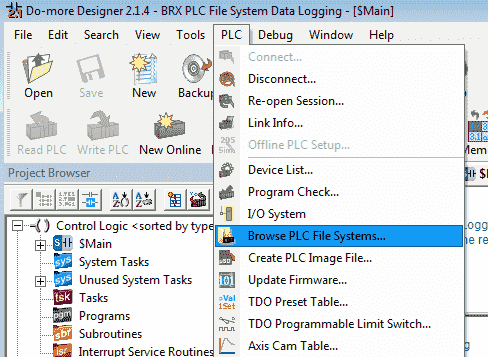 The Browse PLC File Systems window will now appear. We now see our two files that are being logged. Notice that the format of the file is the same as we expected with the name followed by the date. 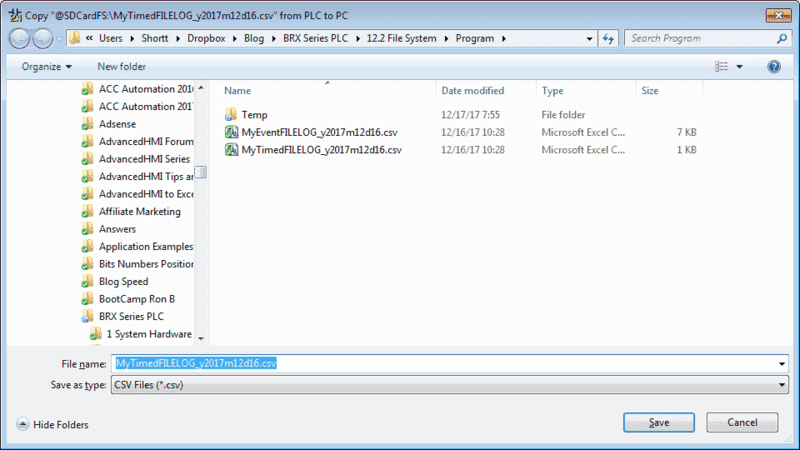 Double clicking the file or selecting “Copy Selected File in Do-more PLC to PC” will display the following information for saving. Do the same for both of the files that we have logged. We can now call up the files using Excel or any other program that will read a CSV file. Here is the event driven file. You will notice that the numbers increment by one every second. 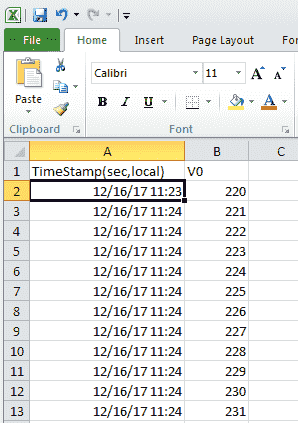 Here is the time based file. There is a difference of 60 between the numbers. This is because we have set up the time for 1 minute updates. 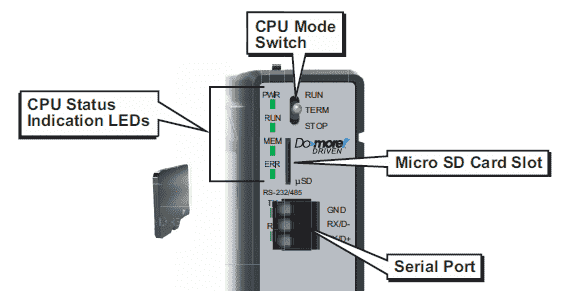 Setting up data logging in the BRX series PLC is very straight forward. One instruction is all we need to accomplish our data collection. You can watch the video below to see this data logging in the BRX Series PLC. Next time we will look sending email with file attachments in the BRX PLC.